This is my first posting to the new blog about photography, so my apologies to anyone who’s started following this site on the assumption that I blabber on about SEO and marketing related topics all the time. I commute to work, as many of you surely do. Twice a day I tootle across the countryside in our long suffering MX5, which aside from being 20 years old now is ailing distinctly from the gravel road portion of the trip it endures five times a week. On the way home, for a few months of the year I’m travelling during golden hour. For those not of a photography bent, golden hour is the magical bit before sunset and after sunrise when the low sun angle creates the wonderful golden light you see on sampler biscuit boxes and the cheap post cards your auntie Mavis sends. For that reason I regularly lug a camera along with me. Many suspect it’s because I’m always on the hunt for road accidents but in all truth I’m more likely to cause one when I see something interesting and veer suddenly off the road to satisfy my itchy shutter finger. On the way home tonight I had just such a moment, although because I was on a railway over bridge at the time I resisted the urge to suddenly park up, and decided the sensible thing to do would be park up and walk back to the bridge. For those who know Christchurch, we’re talking about the Sockburn over bridge in Christchurch. 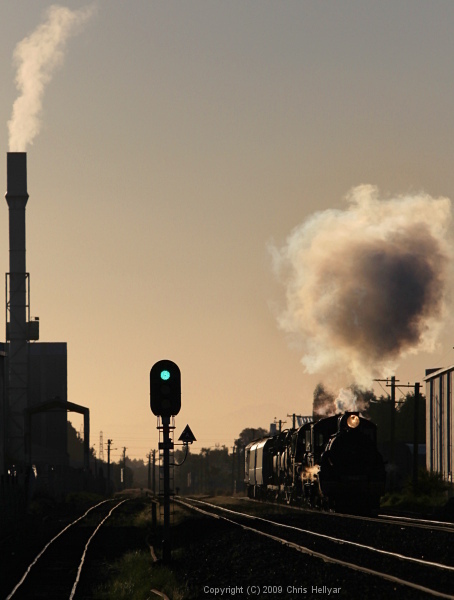 The thing that caught my eye was the smoke stack for the Ravensdown fertiliser works, backlit by the setting sun. Golden hour and all that. I took a few shots from the top of the bridge, looking east into the sun, but didn’t really come up with anything that I liked. This HDR was about all I could muster from up there, and decided a bit more adventure was in order. 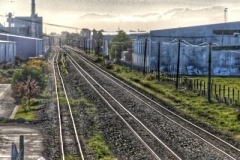 In this case creating the tone mapped image is an attempt rescue a bunch of pretty average looking bracketed photos. I’ve been known to poke fun at people who try to rescue poor photos with editing gimmicks. Paint me guilty. Next I went further into the scene, looking for the thing that caught my eye from the road. The smoke, or steam as it probably is, was arching out to the north when it first caught my eye, framing something. 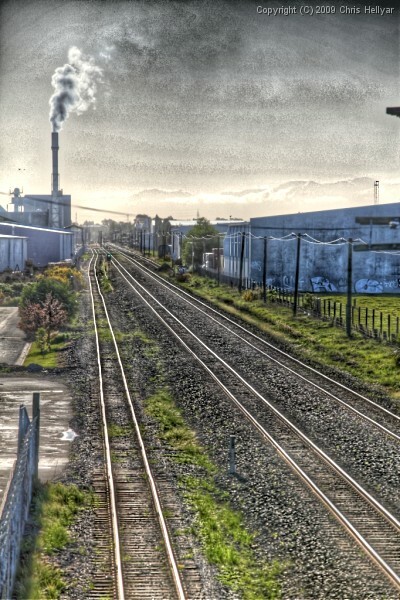 Something was needed to frame, so I parked up closer to the tracks and broke several laws and cast personal safety to the wind by wandering along the rails till I got this shot. 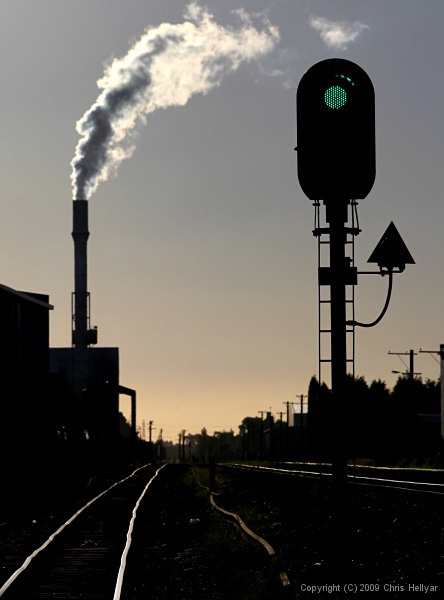 Maybe an interesting concept-stock shot for a green light for pollution? 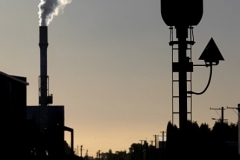 Green house gases? Not sure but certainly nicer to get it out of the camera rather than having to try and rescue it by twiddling with a mouse and keyboard for 30 minutes. Off to the left of this scene is an empty section with some old car bodies, burnt out couches and a pile of general crud. All the normal detritus of human evolution we expect in industrial areas. There’s something magnetic about an empty lot near railway tracks that pulls in cars and couches like a black hole. After a ten minute ramble this old trike catches my eye. Bang up the contrast a bit, add an odd tint and you’ve got one of those mournful shots which makes us wonder where the children are who used to play with the trike. How did it wind up here? 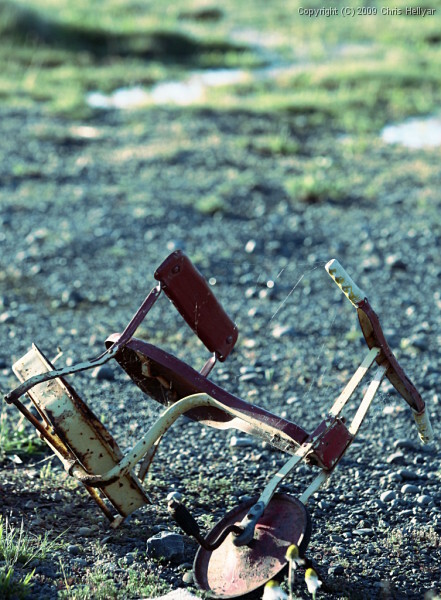 Just as the junk was attracted to this location we seem to be drawn to broken toys. A time check and I’m running late. Best be on my way, so I pick my way through the broken glass and head for the car a few hundred meters away. As I’m walking I hear a lonely steam whistle. Odd. The fertiliser plant must have one? They’ve got a boiler of some kind, so maybe a shift just finished? Walking with my back to the sun I can hear the whistle again, a bit louder. 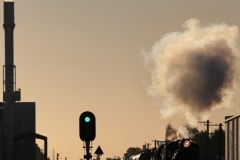 I reckon that’s a steam engine, can’t be. I’m no-where near any tracks. I go from casually walking away from the sun to trying to run into it. I’m sure any normal person would just wait for the train to go by. It’s not entirely sensible to try running into the sun wearing leather office shoes over railway ballast. Then I’m not an entirely sensible person, or so I’ve been told. Close enough, it’s actually moving quite fast. I have a minor panic attack trying to remember how I exposed the sky on the previous photos. Even the best camera will have trouble pointed almost straight into the setting sun. Remember your mum always told you not to point your camera at the sun? Focus on the train, expose on the sky, 1.3 stops down. Bang off as many shots as the camera will store. 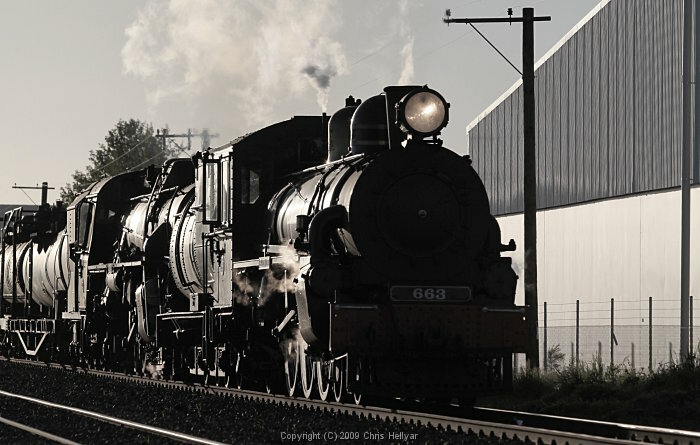 It’s a pity they don’t run coal these days, the smoke is a bit disappointing but the noise and atmosphere a steam engine projects can’t be beaten. 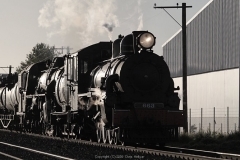 I’m standing about 15m away as the two engines rumble past with the plate glass carriages of the Tranz Scenic tucked in behind in a juxtaposition of ages which seems right in the same way putting wire-rim mag wheels on a Model T does. Are you part of the Four Percent? I just bought a pair of shorts. Puma ‘essential workout shorts’ to be precise. I don’t think I’ve ever purchased a Puma branded product before, although I was aware of their brand. Puma are well known but the only reason I chose them was that I was looking for shorts, and their local outlet store had a sale on when I walked past I the mall. Now that I’ve made my first Puma purchase, the likelihood of be being loyal to the Puma brand in the future is very high. Not because the product was cheaper or better than their competitors, although the price was good due to the sale. Not because an attractive and successful athlete endorsed them, or because they give 5% of all their profits to the crippled outer Galapagos tree frog foundation. I’m am now converted to the Puma brand and products because I am part of the 4%. We’re constantly bombarded by brands. All vying to be the ones we think of when in need of a left handed can opener, or leather pouch for the nose hair clippers. I’m probably not a typical consumer, but I’m sure I’ve purchased at least a couple of other ‘branded’ clothing items in the last year. Neither of those purchases were vaguely memorable for me, and without searching my closet I can’t even recall the brands. The thing that has made me want to talk about Puma is their Swing tag. You know the annoying bit of card you chuck away as you unwrap your shopping. Put some technical stuff on there about amazing fibres 10 times the strength of steel, yet able stretch to over 5 times their length while breathing like Indian cotton. Right? Some pimply marketing intern at at Puma went to a lot of trouble to convince the brand managers in their proverbial glass tower that only 4% of consumers actually read the swing tags anyway, so you might as well target them to those individuals who bother to read all the nitty gritty. And how do I know this mythical 4% figure exists? 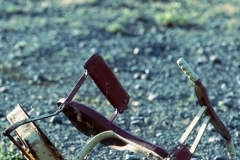 Click on the image at the top of the article, it’s the inside page of the swing tag. When I buy a product and the tag or documentation tells me what I expect, I quickly forget the purchasing experience. 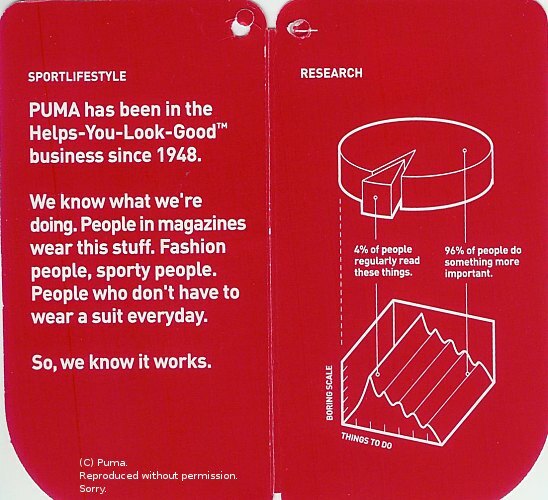 Puma clearly understand and apply what online advertisers have known for some time. Consumers are blind to advertising. There is absolutely no point in trying to advertise to someone once they have the product in their hand. The barrage of media based advertising, on line advertising, emailed Spam and all the public space advertising has desensitised consumers to the point that they simply block out conventional advertising. 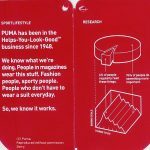 Puma’s tag was witty, and fun to read. I like the fact that such a large company pokes a bit of fun at itself, and doesn’t take themselves to seriously. Next in need of some clothes that look more active than I am, Puma is top of my list. Finally some action from Bing in my search engine race, just after I said I’d given up. Thirteen days is not a startling performance by any measure, and there appears to only be the home page in the index so far, but that’s at least a good start. Searching for phrases on the home page works, so it’s fully indexed, and the content it’s indexed appears to be from yesterday. 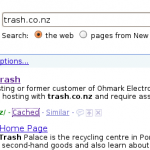 What’s more exciting is the old URL’s which were invalid have now vanished from the site:trash.co.nz search, although the one disallowed in robots.txt is still there. While we’re on the subject of Bing… I read an Interesting tid-bit on Dave Collin’s blog about Bing providing a twitter search facility. Seems like I might have spoken too soon when I pulled fun at Bing about not being real time. A quick play with the beta test Bing/Twitter search engine shows that Bing is at worst 2 minutes behind Twitter. Dave’s blog can be found at http://blog.sharewarepromotions.com and has some good general ‘net marketing information. You can follow him on twitter at http://twitter.com/TheDaveCollins. I’ve just finished watching a re-run of the BBC’s Top Gear. Richard Hammond took on an RAF Eurofighter in a Bugatti Veyron in one of their classically contrived races. The Eurofighter came in first, but the Veyron wasn’t too far behind. It was a race of sorts, give or take. I only wish I could say the same for my attempt at search engine spider racing. Google came in first by a country mile, with a complete indexing done in about 84 hours. We’re 10 days, a full 240 hours, into the race now and Yahoo has managed to get a grand sum total of one page indexed. Bing is hanging out down at the start line with it’s eye candy interface clinging onto some pages that have not existed on this domain for at least two years. While it is possible that Microsoft have developed a time machine, I think it’s more likely that msnbot doesn’t know an http 404 response from a mouse pad. Combine that with an inability to honour robots.txt and I’m not sure the folks up in Seattle know for sure if they’re running a search engine or a cake stall. There has been a buzz in the blogsphere about real time search for a while, with twitter leading the charge in delivering on the dream. Twitter of course has the advantage that all the content it needs is provided on it’s doorstep by hordes of twittering users. Back in the world of conventional search engines the battle to gather content is fought by the spiders. Clever robots sneaking around the web on the constant lookout for new or changed stuff. Indexing, ranking, summarising. The unsung heroes in our digital world even. No prises for guessing how poor the real-time search ability of Bing is going to be if it takes longer than 10 days to index data that was handed to it on a platter, and 2 years to remove content that has been returning a 404 for that long. My website is an internet backwater, I’m quite realistic about that little detail, but if Google pays attention to me, I’ll focus my SEO attempts on Google and ignore the other bit part players for the time being. “It is my pleasure to inform you that on September 30th, 2009 your information was reviewed and accepted for inclusion in the 2009/2010 edition of our registry. It sounds almost too good to be true! Well, as it turns out it is way too good to be true. I filed this in my ‘must read that later’ folder in my email, and just got back to it today. About 30 seconds with Google and I discover than Strathmore’s Who’s Who is not exactly almanac of all great achievers they would have you believe. It is in fact yet another scam to separate the gullible from their money by stroking their fragile egos. Not that I haven’t got a fragile ego myself. I diligently saved the email, and went to their website. The alarm bells rang for me when I saw how much information they wanted for me to be listed. If I was truly selected for this amazing honour you’d think they’d have at least Googled me, as I was about to do to them. I’ve had an online footprint for way too long now to be even able to hide from the lethargic spiders living over at Microsoft, and Google has a way of finding all sorts of history even I’d forgotten. Even more alarm bells ring when you find out they want you to part with up to $700 in hard earned moola to be listed. So there go my hopes of being one of the ‘Who’ again this year. Oh well, back to the grindstone. As an interesting aside, the invitation came to an email address that I’ve only had for a short while compared to my main personal ones which have been published in plain text on the web for about 12 years now. So why did the spam bots find this address and not my two published ones? I suspect that was because the new one is on a .com domain. It was published on company blog posting about two months ago. Well, in my humble opinion it’s been a very poor showing from Bing and Yahoo in my search engine race so far. Google has now spidered, and indexed pretty much the whole site, but Bing and Yahoo have failed to fully index even the home page despite visiting the site a couple of times. Yahoo is coming in runner-up as it has made a start on the process, with their site explorer showing the new <title> tag from the site. That’s a clear step up from Bing which still shows URL’s which have not functioned on the site for a number of years. 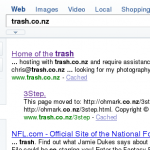 Searching for site:trash.co.nz on Google shows me 35 listings, which includes some of the old obscure stuff which has been given a new burst of life due to inbound links and the effect of having the 404 page responding with valid HTML as I described in my previous post. Bing gives 7 results, one of which is disallowed in robots.txt, the old home page entry and five links which were removed from the site in 2004 when I sold my hosting business, although I believe there may have been valid pages on those url’s up until 2007, so we’ll give it the benefit of the doubt on that. 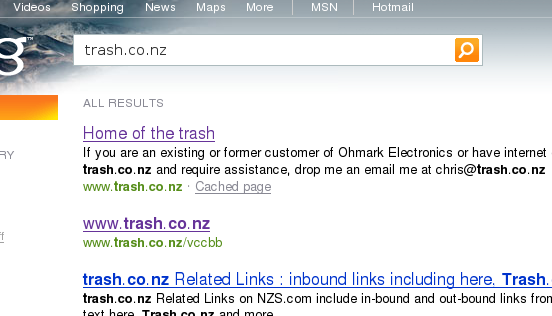 Bing gives the same results for www.trash.co.nz and trash.co.nz as does Google. 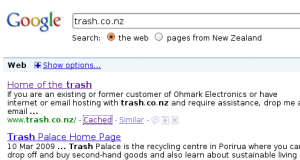 Yahoo takes you to the site explorer page when you search on site:trash.co.nz and the results speak for themselves. 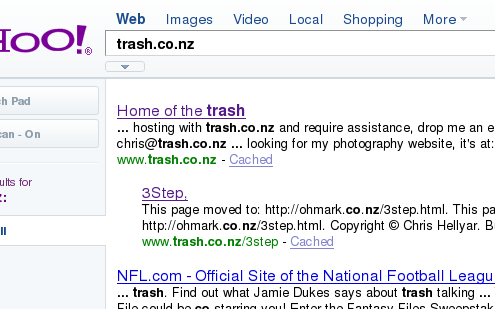 3 URL’s, all of them with old content, but if you specifiy www.trash.co.nz as the url it does show the new <title> so I think it’s going to come in second place, leaving Yahoo out in the search engine cold. 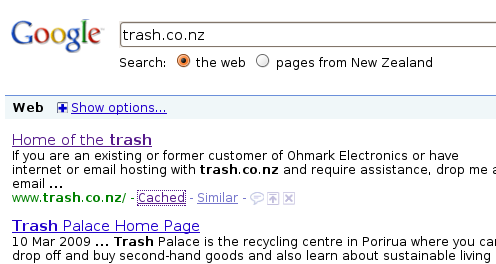 I was surprised that yahoo hasn’t figured out that www.trash.co.nz and trash.co.nz are the same thing mind you, although that may well come with time as it’s databases update. Almost 6 full days after submitting the sitemap to the big three, and it’s pretty apparent that Google’s spider and indexing process is far more effective than either of its cohorts. Submit cnames for your sites separately to the Yahoo spider, it treats them separately, or at least when partially indexed it does. The race is in its final stretch now, with Google coming in the winner sometime over night, NZ time. The new content of a few of the pages is up there, and searchable. Not only that but if I cherry pick some phrases from my blog posting from last night I’m hit number one and two which re-enforces some of the basic precincts of search engine optimisation. What’s also interesting is that the content snippet that Google presents under the title is different for a given page depending on what you searched for. Hmmm, SEO theory #321 out the door. The meta description is not always used by google to present your results. 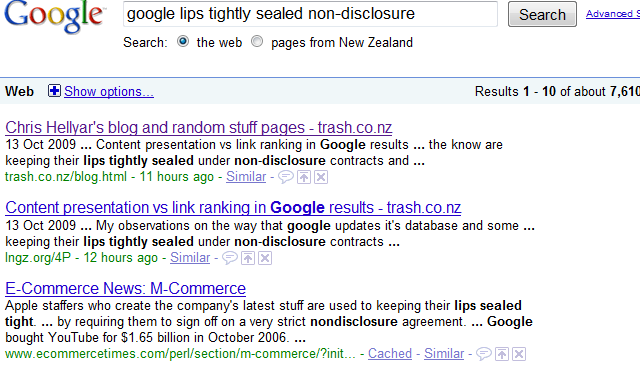 The screenshot on the left shows the search results for ‘google lips tightly sealed non-disclosure’. 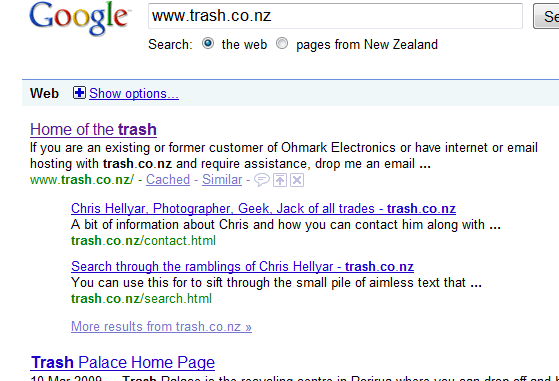 Top hit is trash.co.nz/blog.html with an extract from the blog posting from yesterday that had that text in it. The second hit is a shortened version of the link I posted to Twitter, going to the actual blog posting. The second hit is a direct one to the blog posting via my link-shrinker. This hit shows the description meta-tag verbatim as common wisdom would suggest. The link was posted to Twitter about 10 minutes after I posted that blog entry last night, so it got spidered, indexed and searchable in under 12 hours which tells us that Google definitely plays favourites. So, come on down screenshot number two. 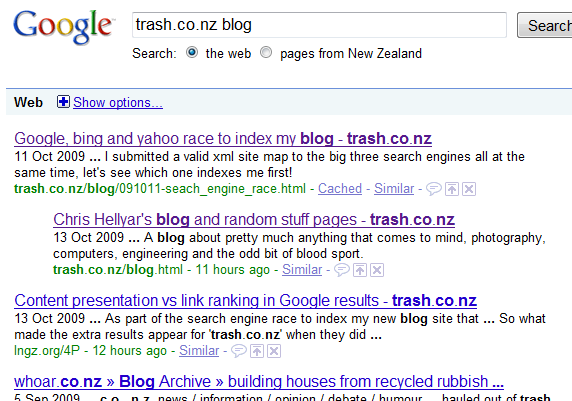 Searching for ‘trash.co.nz blog’ gives me the two top hits again, but this time it’s given the meta description tags for both hits, even though the first one is the same as the first in screenshot two. Hit number three is my twittered link again. Nice. The other interesting thing about this is the dates that appear at the left of the descriptions. They are not in the meta tags, but boy-o-boy do they improve the effectiveness of the results presentation in Google. 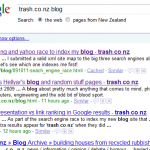 Note that the date shown for http://trash.co.nz/blog.html is different for the two result sets. I’m picking they came verbatim from the xml sitemap in the case of screenshot number 2, and in the case of screenshot number 1 google has done something clever and used the change date for the target of the link in the content. If you don’t already have a valid xml sitemap, what on earth are you doing reading this? Get to it! Meta description tags are all very well, but if your content is tag-soup you may still get crap results presentation. Valid, clean HTML gave me two sets of clean results. Googlebot plays favourites with twittered links, one would assume due to link popularity rules/formula that are secret squirrel stuff at Google HQ. It takes about 84 hours for google to spider, index and summarise new content. In the next couple of days it’s going to be interesting to see how long the old home-page text persists in Google’s cache, and what we get as results from bing and yahoo as they bring up the rear. Adding onto that it’s going to be interesting to see what the refresh period for changes to the site is going to be now that the new sitemap is being used by google. Let the SEO games begin! It’s pretty well known that Google calculates a page rank for every website it indexes, and that the page rank is a complex beast created from an aggregate score of a whole bunch of things. Link popularity, keywords, content, meta tags, the phase of the moon. 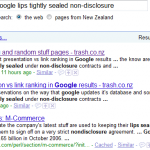 Millions of words have been written about the mystery box that is Google page rank, and all I can say definitively is that it exists, and SEO ‘experts’ can only guess at exactly how it works because the people at Google in the know are keeping their lips tightly sealed under non-disclosure contracts and the pain that only corporate lawyers can inflict. My observation is about the presentation of content, and the calculation of page rank. It appears to be two separate processes, which leads me to assume that the Google monster keeps it’s data in at least two separate databases one for the page rank, link popularity and URL information and a second for the content, titles, and summaries information. For that matter there is probably a third, which has the all important keywords index information with it’s magical mix of synonym and phonetic matching that makes Google far more useful than it’s competitors, or at least I my humble opinion. 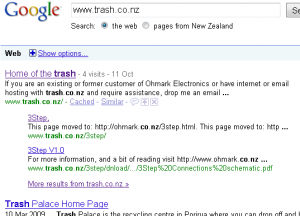 I’m making this all up on the basis of the changing search results for ‘trash.co.nz’ after I put this site online and submitted the new xml sitemap to google. See the before and after screen shots below. Results before the October 10th. The ‘after’ is around 60 hours after the before. 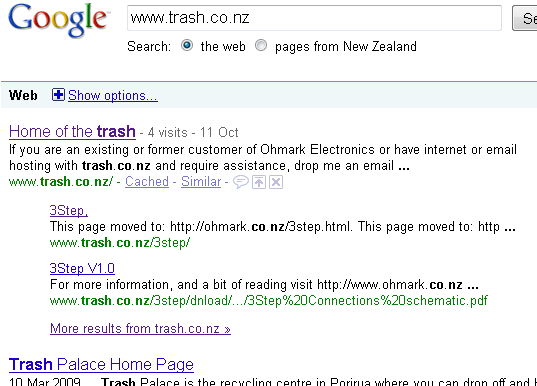 So what made the extra results appear for ‘trash.co.nz’ when they did not appear two and a half days ago? The two extra pages are linked from the forums site www.cnczone.com and get 4-5 hits a day from there. Before I put the blog online they had some holding pages saying that I’d moved the content to another one of my sites, www.ohmark.co.nz. The HTML was poorly formed, there was only one link on the page, no meta description tags, and little content of any sort. Skip forward to now. Those links land on the new CMS and get redirected to the 404 page. The new page has properly structured HTML, meta description tag and multiple links. So, by my reasoning the page rank of the page increased, so the links became relevant enough to show in the results for trash.co.nz. Up until I change the content that was not the case, as the quality of the content on the old pages was quite low. So, why is the new content not showing in the results? I’ve got a valid, unique title, and an equally valid, if not slightly silly meta tag description. That’s where database number two comes in. The quality and ranking of my newly improved pages was stored by the spider on it’s first visit while following the link from www.cnczone.com. That went into database number 1, the page rank database we’ll call it for want of a better term. At some stage in the next day or so I imagine that database number two will be populated by another visit from googlebot, where it will scrape the tag, and description and update the results in the page. This step will then probably populate database number three with the keywords, which will then recursively affect he page rank via link relevancy and the phase of the moon. Also note that there is no ‘Cached’ link under the pages, I’m assuming that the second pass of google bot will enable this, and even though it had the description and title for a link the quality of the page was not high enough in the past to warrant caching a copy. HTML quality does matter. If you’re involved in SEO work and didn’t know that you’ve probably chosen the wrong career. HTML quality effects Google’s cache. It doesn’t cache junk pages. Googlebot makes multiple passes to create an update to a page. In this case it got the pagerank / link quality rank up first, and has not got the content yet. Now, lets see who wins the race to index the site fully. I’m not much of a racing fan normally, but I thought it’d be entertaining to see how long it took the big three to spider and index my new blog after submitting a valid xml site map to their respective webmaster tools pages. 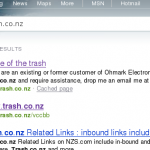 This domain, trash.co.nz has been around for a fair while. It used to have my web services information on it back when I had pretensions of being a small time ISP. However, for the last few years it’s been the home of a single page message saying that I’ve packed up my bag and moved onto other things. 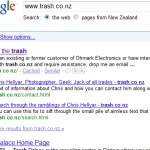 So all three search engines have trash.co.nz indexed, and they all produce the same top hit if you search for trash.co.nz. The race is to see how long it takes them to pick up the new page content and get it indexed. This is in a small way a bit of a validation experiment for myself as well. We all know the theory about description meta tags, sitemaps and so-forth, don’t we? As a slightly annoying aside, the results above for bing show the path /vccbb which was in my robots.txt as a disallow for the last two years. Possibly someone from Microsoft needs to read up on how the standard works. So, there you have it, my first real blog posting, and the scene is set for a major show-down. As of this very minute none of the search engines have changed their results yet. This is so exciting, I might. Well. Go get a coffee. The title says it all really. Welcome to my new blog / website. The intention is to slap all sorts of random things on here. The topics will be as varied and random as my wandering attention will allow. Occasionally some of it will be interesting as well. Although probably not all that often! If you’ve landed here and this is the only posting it’s probably a bit early to understand what I mean, come back in a while and you’ll get the idea.